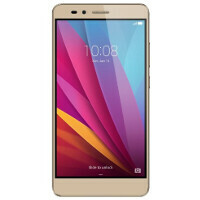 The Huawei honor 5X, which makes its début today in the United States, will be launched in Europe later on this week. February 4th is the official date, with a live event running from 2:30 PM to 9:30 PM (GMT) to mark the occasion. Thanks to a bevy of powerful, cheap handsets in recent years, there's been arguably less interest in the likes of the Samsung Galaxy S and Apple iPhone. Two of the biggest names in consumer tech, they're both now facing a wave of competition at the hands of firms like Huawei, and as we look ahead to the impending launch of the Galaxy S7, the honor 5X offers a varied feature set at a fraction of the cost. If you're looking for a cutting edge, top-end handset, then the honor 5X is not it. In our review, we found the 5X to be rather sluggish at times, while the very basic utility of making a call was hindered by sub-par quality. But for change out of two hundred bucks, it'd be naive to expect miracles. For its faults, you still get dual-SIM functionality, microSD, a nifty fingerprint sensor and metallic design complete with a slick, beveled edge. Out of the box you get a decidedly average display, average camera, and similarly mediocre battery life to boot. But for the price, the honor 5X still looks a decent deal, and if you've had your eye on this device from somewhere in Europe, your wait is almost over. Interested parties can register with their email through vMall for a few added bonuses, including £20 (around €26, $29) off the honor 5X and a further voucher saving for a future purchase. Click here if you'd like to check out our in-depth review of the honor 5X, and hit the source for more info on those early bird savings.